ML2N2O_NRT is the EOS Aura Microwave Limb Sounder (MLS) Near-Real-Time (NRT) product for nitrous oxide (N2O). This product contains N2O profiles derived from the 190 GHz region. The NRT data are typically available within 3 hours of observation and are broken into files containing about 15 minutes of data. The most recent 7 days of data are available online. Spatial coverage is near-global (-82 degrees to +82 degrees latitude), with each profile spaced 1.5 degrees or ~165 km along the orbit track (roughly 15 orbits per day). The vertical coverage is from 100 to 1 hPa. The MLS v4.2 NRT algorithm uses a simplified fast forward model to meet Near Real Time data latency requirements and are therefore not as accurate as the retrievals that constitute the standard MLS products. Nevertheless the results are scientifically useful in selected regions of the Earth's atmosphere provided that the data are screened according to the recommendations in the MLS NRT User Guide and the MLS L2 Data Quality Document for Standard Products. The MLS NRT data are not as accurate as the retrievals that constitute the standard MLS products, but nevertheless the results are of scientific use and track the standard MLS products with reasonable fidelity. Please see the MLS NRT User Guide and the MLS L2 Data Quality and Description Document for details. Access the data via HTTPS. User registration is required. 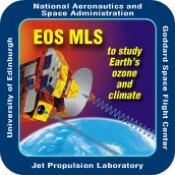 Register for a username and password at https://urs.eosdis.nasa.gov/users/new.